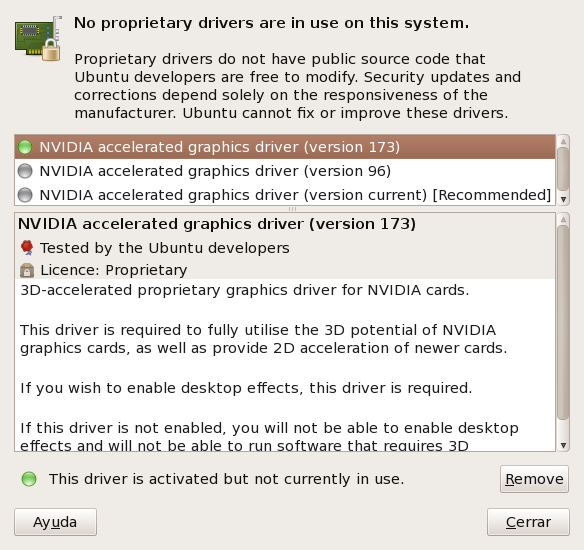 I can confirm this issue using the Lucid Lynx installation and the nvidia-current(nvidia-graphics-drivers-190) drivers. I do have the message when checking under "System -> Administration -> Hardware Drivers", 'This driver is activated but not currently in use.' No desktop effects can be enabled. However, I can now activate the desktop effects in "System -> Preferences -> Appearances". I have the same problem here, too. I attach an screenshot to illustrate the problem. I've just discovered this bug too. Digging further it looks as if the PCI aliases declared by the module nvidia-current (/lib/modules/$(uname -r)/updates/dkms/) do not match any in "/usr/share/jockey/modaliases/nvidia-current"
I don't have time now (focused on packaging several other bug debdiffs) but could some try adding one or more of the current module aliases to "/usr/share/jockey/modaliases/nvidia-current" to see if that solves it? The only bit I'm unsure of is which aliases to add, but I think the existing jockey file entries should give a good idea of what is expected. according to nvidia-current default aliases. Then run jockey and still "No proprietary drivers in use". corresponds to in order to see if it's really enabled (LP: #547066). This involved overriding the enabled() and the used() methods. Fixed for me, too. Thanks.